If you used the Internet last week, you may have heard about a man named Joe Blumm, the BP worker who taped an angry note to his boss in the window. That note has since gone viral, and as a result it looks like Blumm is out of the job. He told Fox 17 that he'd been working overnight and was waiting for his manager to relieve him--but when she didn't show up, he hit his breaking point. 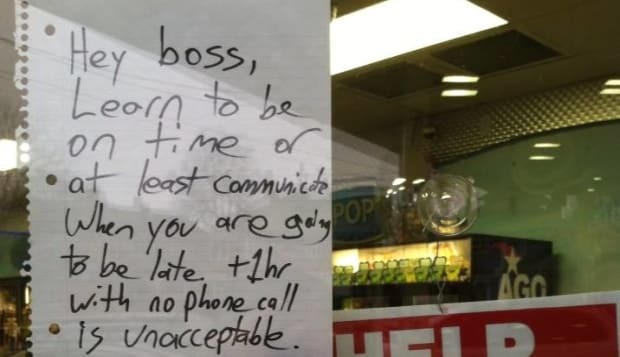 "Hey boss, learn to be on time or at least communicate when you are going to be late," the note reads. "Plus-one hour with no phone call is unacceptable. As you can see, the doors are locked. I went home. Fire me if you must, but realize I walked due to YOUR negligence." 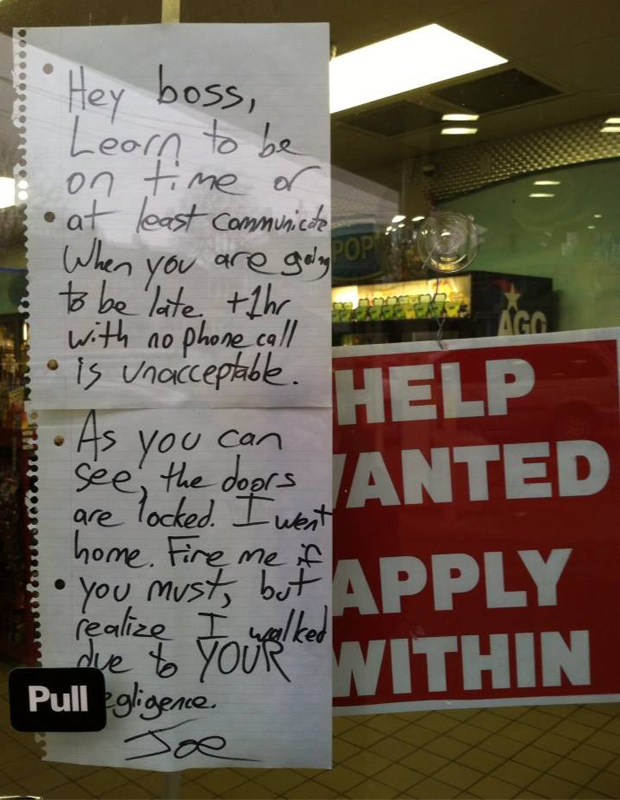 In what was perhaps an ironic touch, a "help wanted" sign was taped up beside the note. The manager told Fox 17 that she was running late because she missed her alarm clock, but that Joe never called her or another employee before leaving the note and locking up. Still, at least one customer was a fan of Blumm's tactics. "I thought it was hilarious," Ryan Olthouse, who stopped to use a pump and discovered the note, told the Grand Rapid Press. He said that most of the other customers also seemed to be laughing about it. After being uploaded to Reddit, the note received over 2,000 comments, as users shared stories of frustration on the job. "If it's not a workable environment, it's not a workable environment," wrote one commenter. That's now literally true for Blumm, who's now reportedly jobless. "I know that I've struck a chord with a lot of low-paid, disgruntled employees who get the short end of the stick," he told Fox. "Hopefully with all this publicity, I would love to have a different job. Something a little bit higher-paying, I would hope." Sounds like a great time to post a note, Joe!